FlowWorks Makes Management of Collections & Treatment Plant Systems Easier for the City of Richmond. In 2014, the City of Richmond was introduced to FlowWorks through working with Infrastructure Engineering Corporation (IEC) and their Operations Manager, George Elaro. The City was intrigued with FlowWorks due to it not being flowmeter specific. The city utilizes meters from ADS, ISCO and Telog and wanted to be able to store all their data in one place, rather than having to be restricted to one software offering or system associated with one brand of flow meters or data logging equipment. The ability to include data from outside sources has also added to the value of the FlowWorks system. The City now tracks tidal data and influences by utilizing tide charts from NOAA. This level of flexibility and robustness allows for a more in depth view of multiple critical systems that now have a common platform to be viewed from. 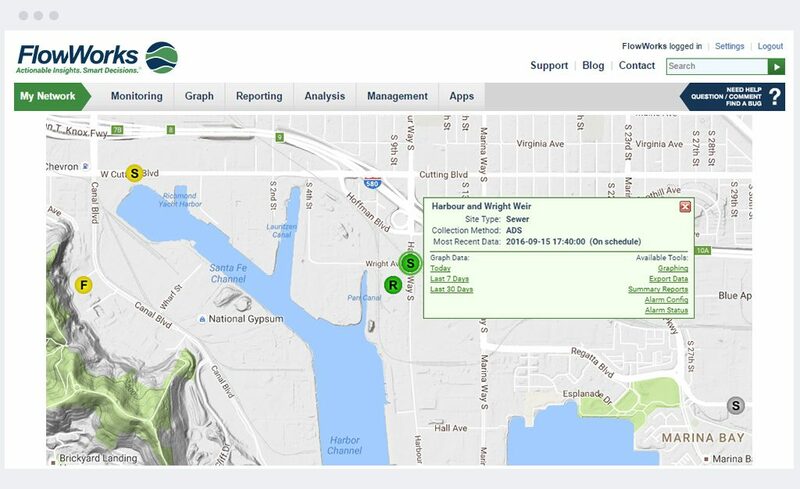 The relationship has been so beneficial, that the City of Richmond is now working with IEC and using FlowWorks for more than just flow monitoring. They are utilizing FlowWorks to include data imported from their SCADA system, as well as with their treatment plant and pump stations. This allows them to create complex alarms and notifications. The City recently extended its existing contract with IEC for an additional 3 years in early 2015. FlowWorks has been pivotal in helping the City to bring data into one platform, keeping it organized with the ease of running reports and generating graphs. This has caused their day-to-day tasks to be simplified substantially. The engineering and management teams now have access to all the flow monitors in the system as well as the SCADA data from the WWTP operations. The ability to view both systems in one easy to access platform has made FlowWorks a very valuable asset in the City’s efforts to identify and plan future capital projects to remove inflow and infiltration (I&I) within the system. The end result is that combined sewer overflow events and potential spills into local waterways are being identified by using a more accurate system with alarming capabilities to warn City Operations and Engineering staff of potential problems before they occur. The added benefit of getting an overall view of both the collections and treatment plant systems gives the City staff and operators better control during critical wet weather conditions. “I feel that the use of FlowWorks offers near real-time data review of flow monitoring networks for decision makers to execute timely responses to critical events such as SSO’s. Also, it offers easy report generation for documenting these critical situations. It is a valuable budgeting and asset management tool with great flexibility and ease of use for multiple users.” Dan Duffield, Source Control Inspector City of Richmond, CA.